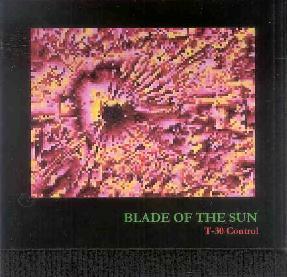 T30 Control - "Blade Of The Sun"
T30 Control is a duo project from British musicians Vincent Rees and Peter Smith. The promo sheet lists Brian Eno, obscure German electronica and Hawkwind among their influences, though the German electronic elements are most pervasive throughout the CD. Tracks like "Paradox" and "Earth Beneath Us" feature classic Klaus Schulze and general German school styled Kosmiche electronica, with syncopated patterns, floating soundscapes, and meditative orchestral waves. "Turn Of The Blade" is a short piece with more repetitive patterns but equal doses of bubbling cosmic space sounds. I would like to have heard this one developed beyond its less than 3 minute length. The pace picks up on tracks like "Too Near The Sun" and "Absence Of Time" as the duo inject dance rhythms into the mix, along with haunting melodic lines, and all the while maintaining the thoroughly cosmic edge that characterizes T30 Control's music. "Rise Into The Sky" is one of my favorite tracks, its rhythms giving the music more of a dark, electronic driven, space rock feel... kind of like Klaus Schulze with some Hawkwind elements, and all buried in a gorgeous symphonic stew. The last 3 tracks on the first of this 2-CD set comprise the "Sunphazer Suite". Rees and Smith do what this kind of music screams out for by taking nearly 25 minutes to develop a more extended theme. Mysterious floating soundscapes and a heavenly but alien aura set the tone for the piece, along with a more minimal and gradually evolving mode of sound construction than the rest of the shorter tracks. Fans of early Tangerine Dream will fall head over heals in love with this one. Along the same lines is "Blade Chant", the 22 minute track that makes up the second CD. The song is actually a remixed version of the "Sunphazer Suite". And just for an extra kick, guest Nik Turner joins in to contribute intermittent monolog bits. In summary, these are top notch space voyages and sure to please fans of early 70's German electronica, ambient/soundscape music, and all things SPACE! For more information you can email T30 Control at: smix80@hotmail.com. Contact via snail mail c/o The Earth Science Group; 17 Elizabeth Rd; Chichester; West Sussex; PO19 7JF; England.